Summer in Tokyo, especially in June, is a very strange thing. With some of the cool Spring air still lingering around, you find that the weather is barely humid enough to even compare to that of Singapore's. On the other hand, the low humidity makes your skin dry out so quickly that you probably need to tank on moisturizers. 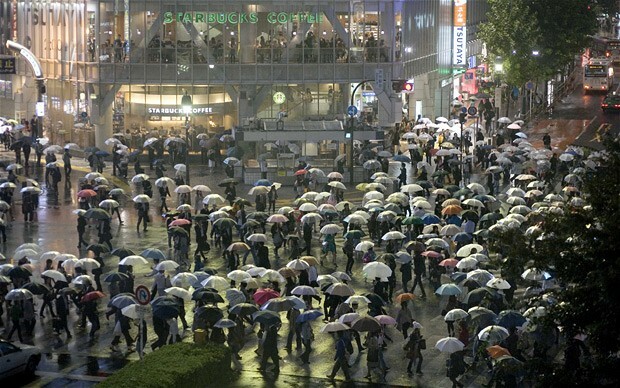 Also, June is the start of the rainy season in Japan, and you'll see most people in Tokyo lugging their umbrellas all around. An umbrella isn't a good object to burden yourself with when you go shopping in Japan, but if you are used to walking in the rain in Singapore, you'll be fine doing the same in Japan. The raindrops are much lighter and finer in Japan, and it seldom rains very heavily, at least when I was there. 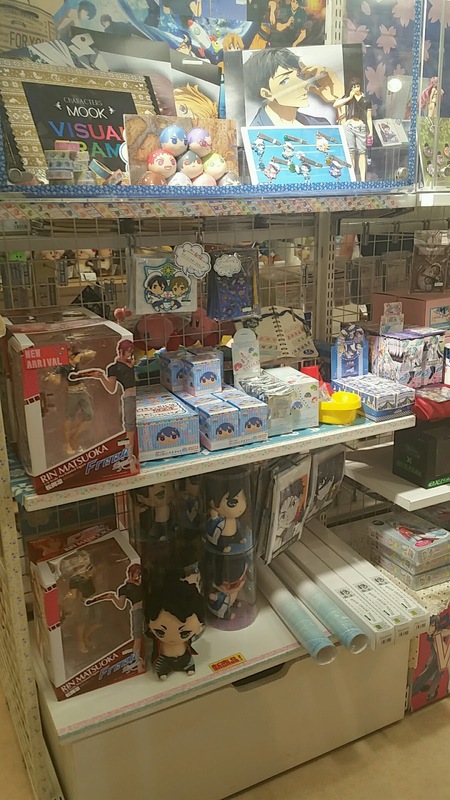 Upon reaching Tokyo, the first thing I did was to drop by my hotel to leave my luggage there and move on to shopping. As I was staying at a hotel in Akihabara, it made the most sense to go to shops in Akiba first before moving on to the other cities. 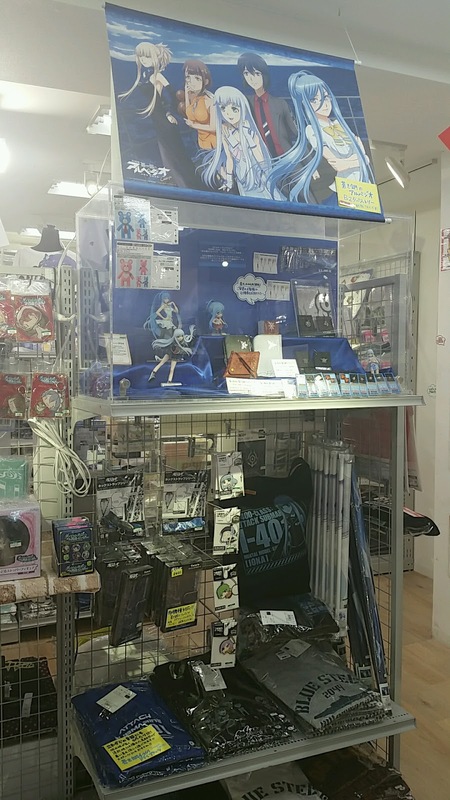 I was planning on frequenting both Akiba and Ikebukuro, but unfortunately, ran out of time and had to skip it. My first stop in Akiba was at Kotobukiya. 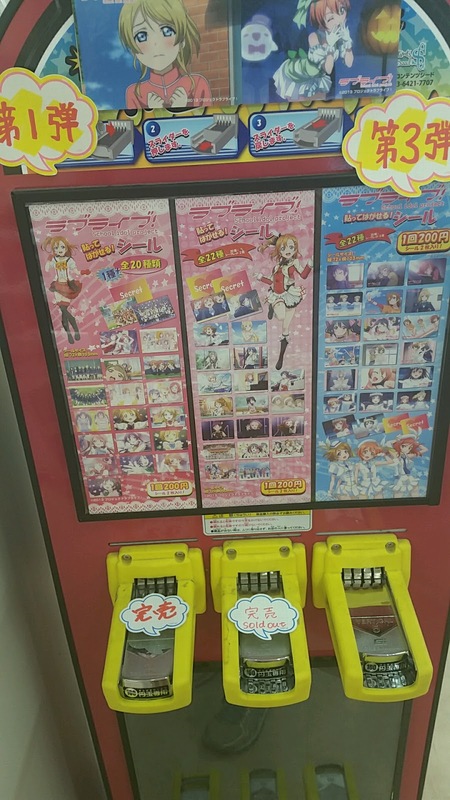 (2) Walk towards and a tall red building covered with the word 'Karaoke' in Katakana. There should be an 'Aoki' building close to it as well (if you can't read Katakana). (3) Cross the road, such that the karaoke building is opposite you now. This road is the Chuo-Dori. (4) Proceed toward a red building labelled 'SEGA'. This is 'Club Sega'. (5) Turn into the alleyway before Club Sega. 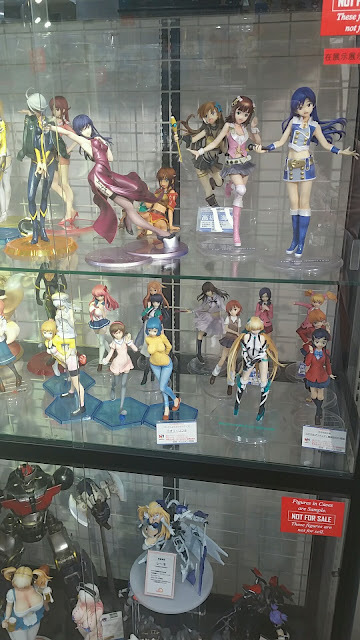 You should be able to see Kotobukiya at the other end of the alleyway! 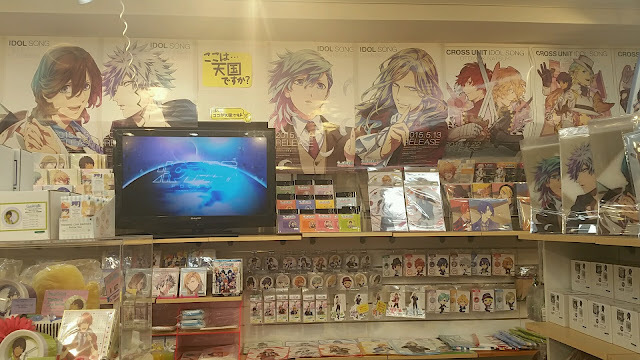 This is actually the store which I spent the most time in for the day as there were things which I was interested in on almost every floor. 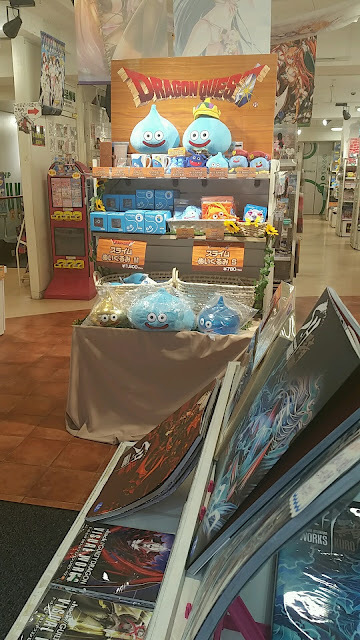 Upon reaching the front gate, the first thing you notice would be their floor guide, gachapon machines and the theme they had ongoing this time round: Dragon Quest! 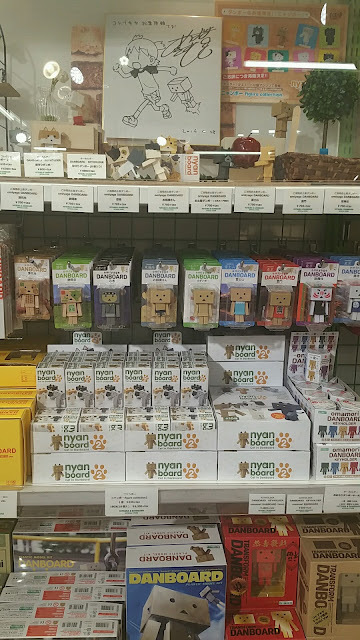 Upon entering the store, the first thing which I noticed was the majestic Danboard displays. There were nearly 3 whole shelves dedicated to danboard goods, as well as a complete detolf. 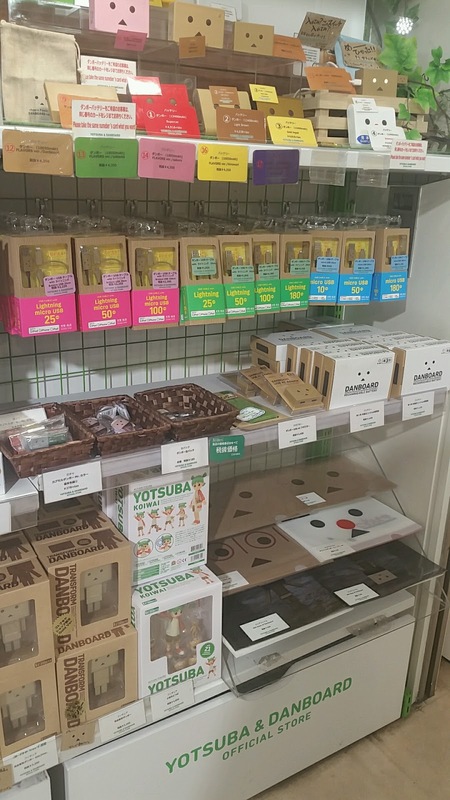 Goods that were sold were mainly the small Danboard figures. 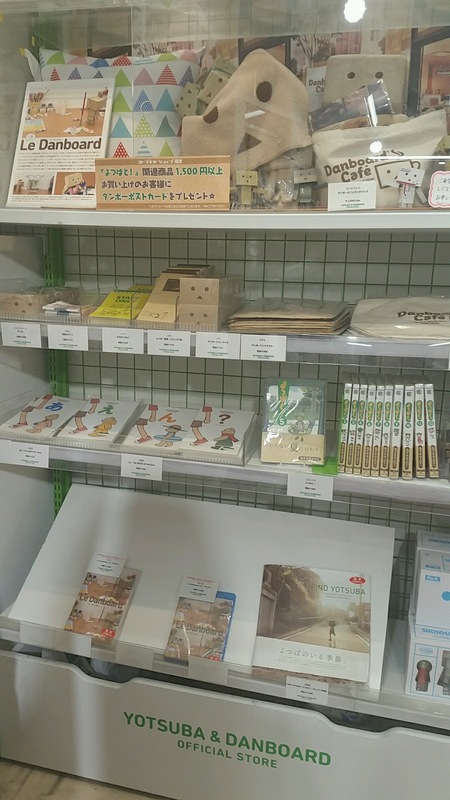 There were many other goods as well, like larger cleaner cloths, however I don't recognize most of the merchandise as I'm not a huge Danboard fan. But even so, the display space and selection was very impressive to me. 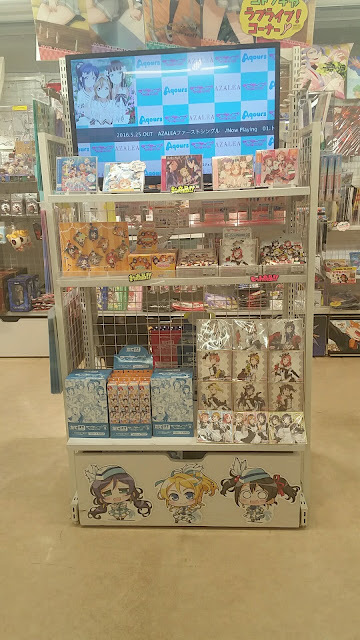 I spent much less time than expected when I went through the Love Live! and Monogatari Series sections. 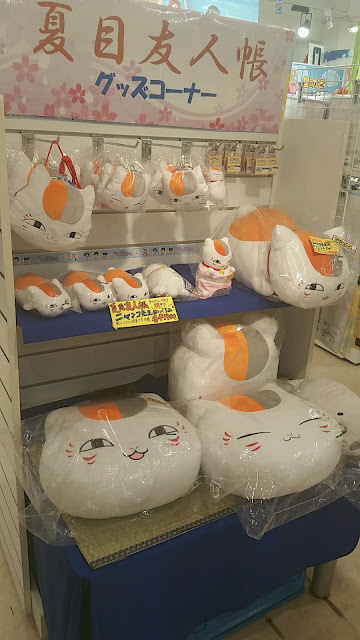 There were fewer goods than what I expected to see, especially for such a well-known shop, but I suppose my expectations might have been set a little too high. 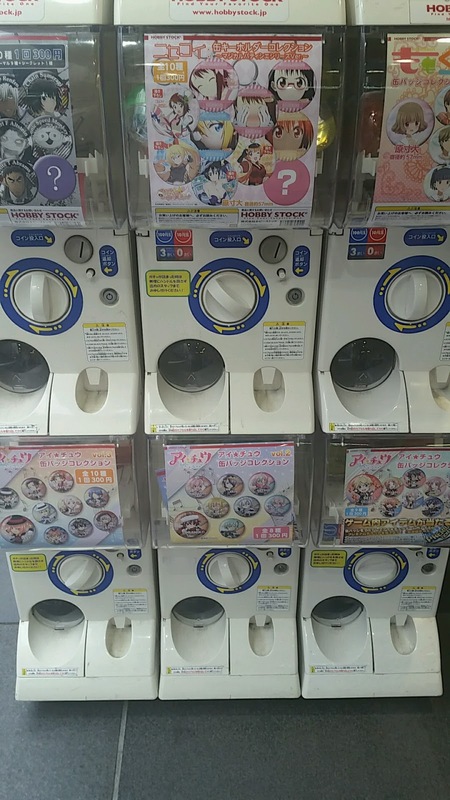 Most of Love Live! 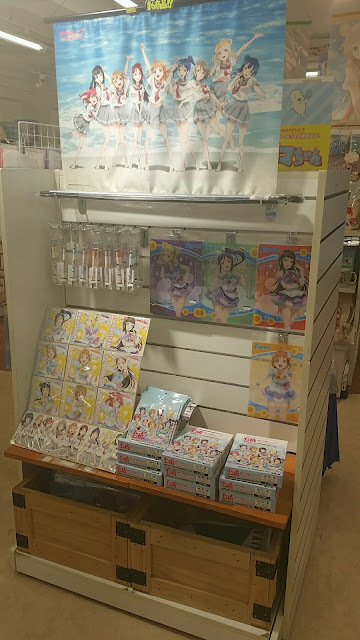 's goods were slowly moving towards Aqours, and though I'm a little disheartened to see such a huge sudden change, at least it's helping me put an end to my feels on their disbandment. Also, Madoka's goods dwindle every single time I frequent this shop as well, and I fear for the next time I set foot in here. 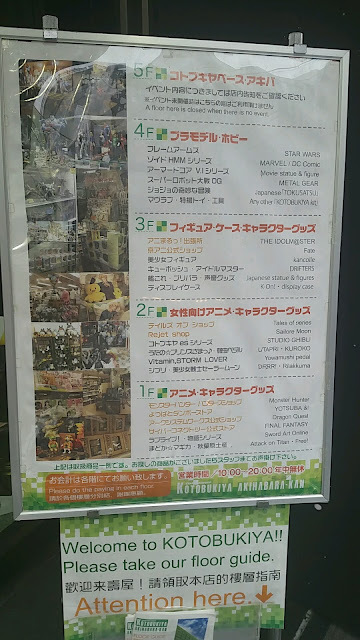 While being on my way to the Monster Hunter section at the end of this level, I spotted many other series not mentioned on the floor guide. 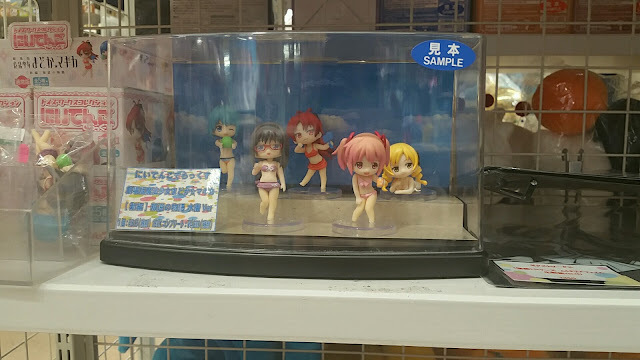 Examples which caught my attention would be Nisekoi (which only had files and a couple of Nendoroids), as well as Natsume Yuujinchou and Super Mario, as well as everyone's beloved series, Free! 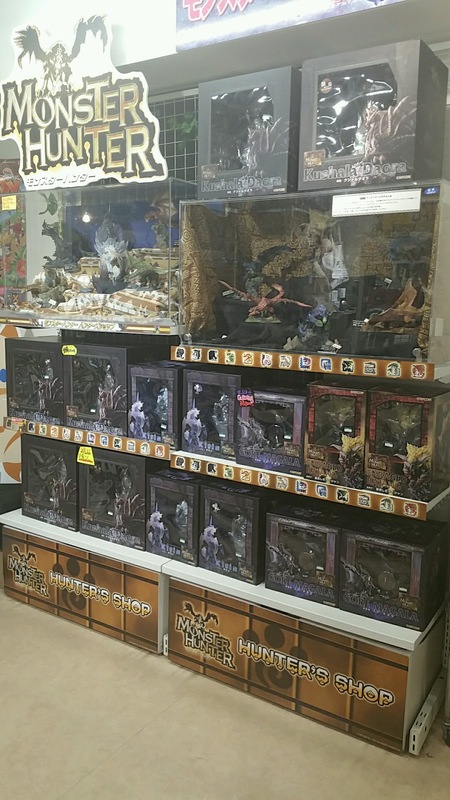 Finally, let's have a slight coverage on the MonHun corner in Akiba's Kotobukiya! 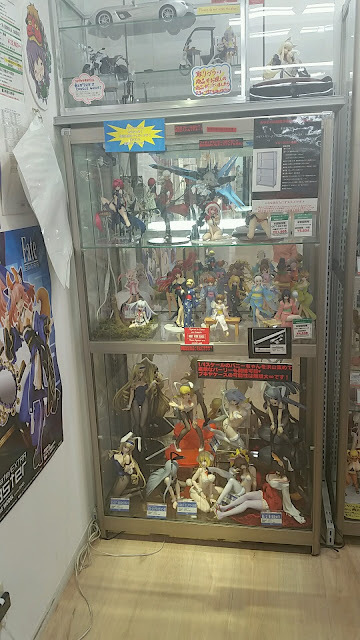 The main goods in this section were mainly figures, of which most of them were priced quite high. 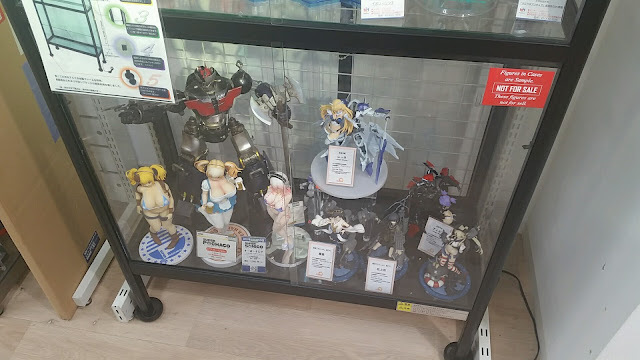 I know that Kotobukiya was quite into making figures for this series and they were detailed and most fetched high prices. However, it was an eye-opener to actually note how much each individual figure cost. The second floor itself is a floor dedicated to female customers, meaning that goods featuring male characters are rampant on this floor. 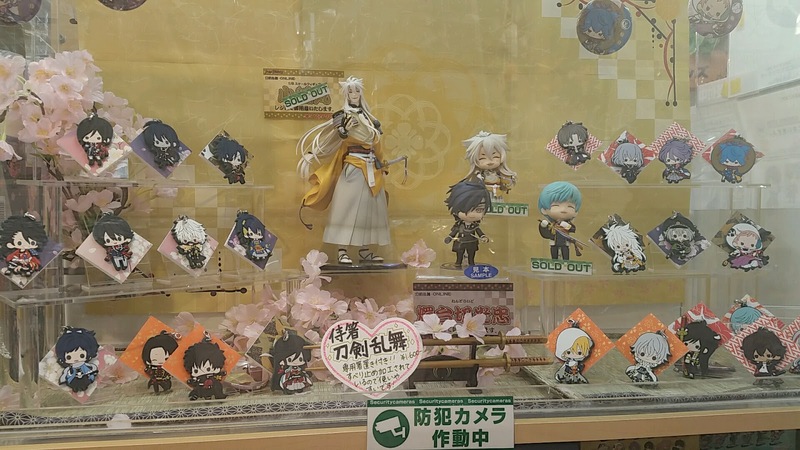 And for me, that means Touken Ranbu. And sure enough, there is indeed Touken Ranbu on this level! Well, and Uta no Prince-sama too, among many other series on display! The third floor is mainly for guys, because it wouldn't be fair to have one dedicated to females but not to males. This would obviously mean the opposite, where female characters are rampant on this floor. As a fan of equal number of male and female characters, if not more females, I would obviously have to visit this floor as well! On this floor, we have Idolm@ster series. 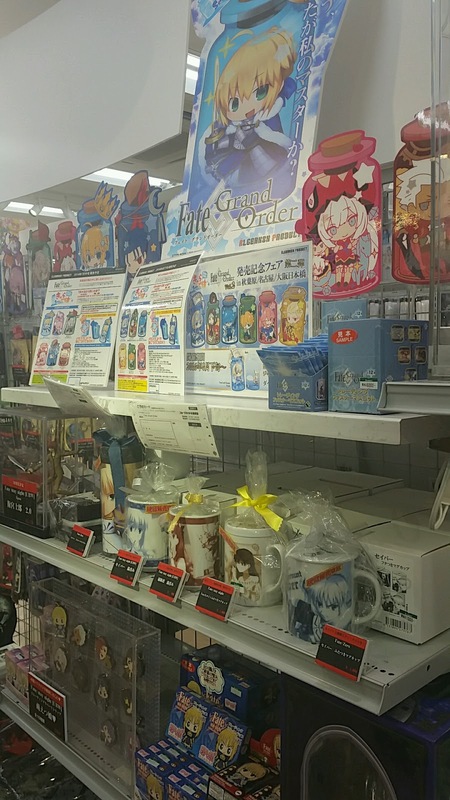 There seems to be an overwhelming number of Cinderella Girls goods compared to the other Idolmaster series. 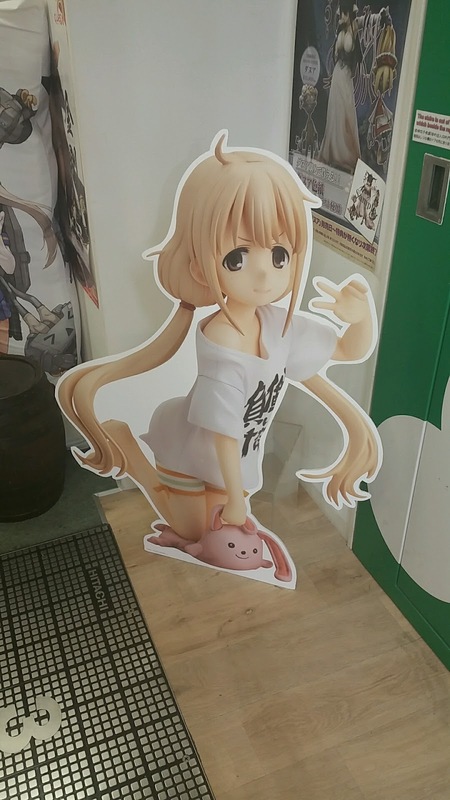 A large cut-out of Anzu is placed on the door to the third floor, and this is one of Kotobukiya's figures. I can't help but think that it's a way of promoting their Anzu figure, but I can't deny that it does look impressive and adds a nice touch to this floor, giving a brief introduction to what this level contains. 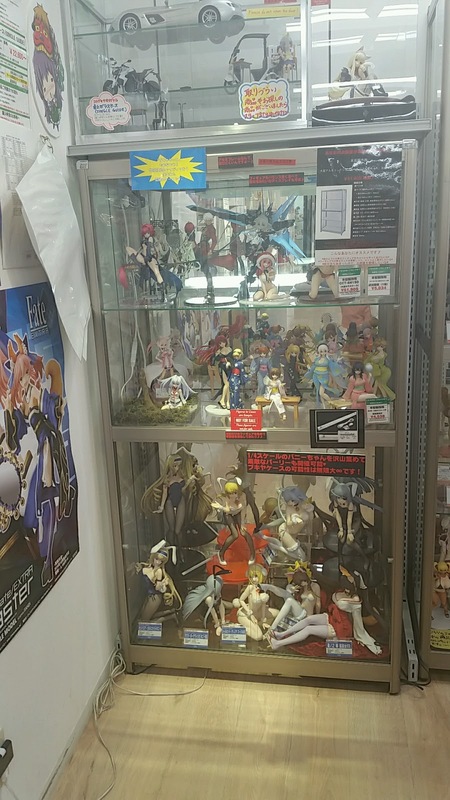 Apart from male-orientated products, this floor also doubles as a figure floor where they sell mainstream figures, of which most are females anyway. 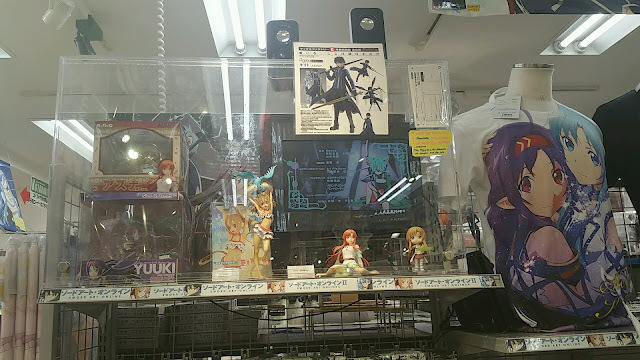 Other popular series like Fate and Girls und Panzer also have their individual displays on this level. 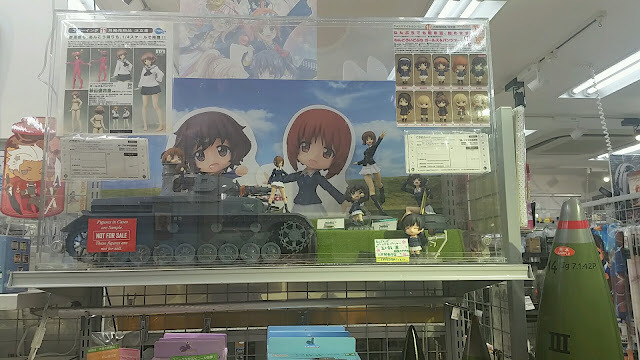 I have just recently finished Girls und Panzer and was rather interested in their goods, however as I am more of a Nendoroid than a Cu-Poche person, and haven't decided if I would like to collect my best girl or all the main girls together, I didn't really find much to fan over for their section. Kotobukiya isn't all that mean to their rival in chibiness, Good Smile Company. 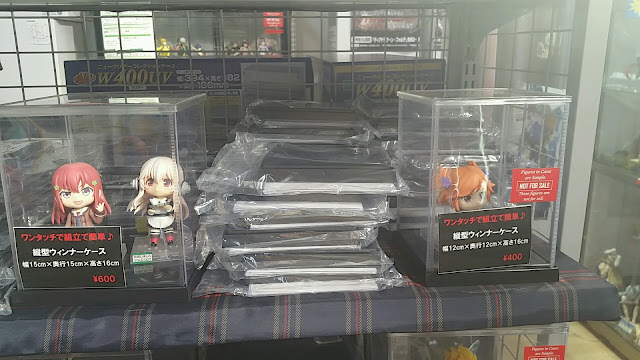 As Kotobukiya is the maker of Cu-Poche, I would consider the biggest rival for that line to be Nendoroids from Good Smile Company. 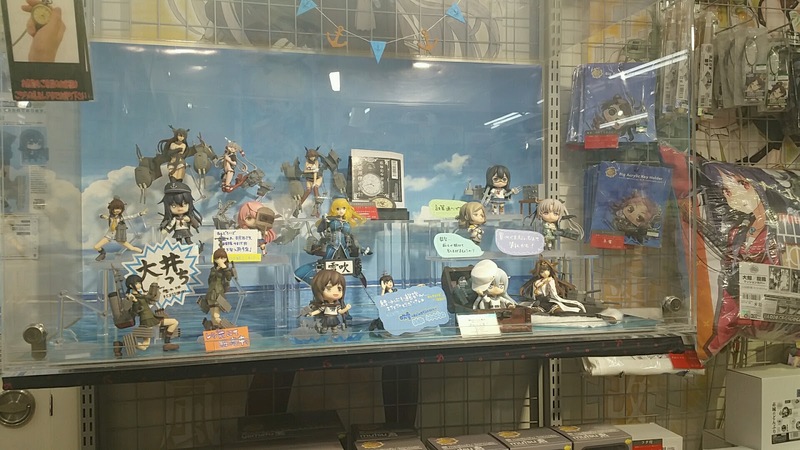 However, they were still having displays of Nendoroids and figmas in their store itself. 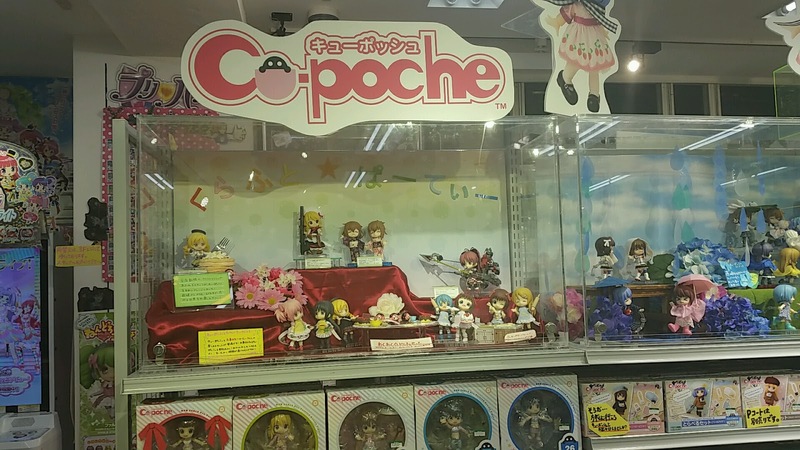 And of course, they have to have their own Cu-Poche section, since it's their original line. 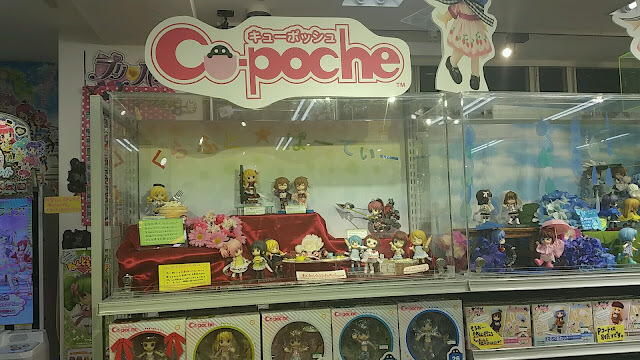 The showcase space for Cu-Poche is definitely much larger than that for Nendoroids, which again, isn't a big surprise. 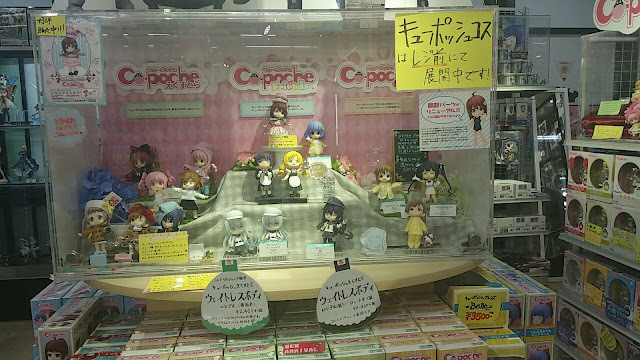 They also displayed the Cu-Poche extras, such as the raincoats, to show how they look in real life. I find this a really good touch since I'll definitely want to see how cloth would look on figures with my own two eyes before I actually consider purchasing it. 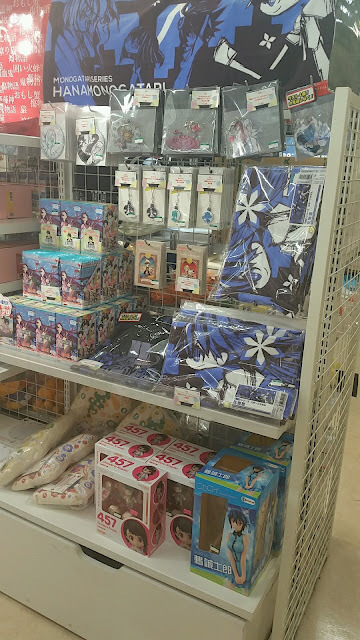 And yes, I was rather tempted to buy some, especially the Yukata set -- and would have, if I managed to find the set. 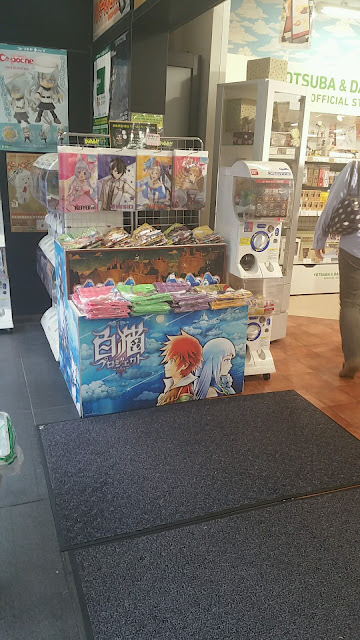 Of course, this floor has series-specific goods as well. 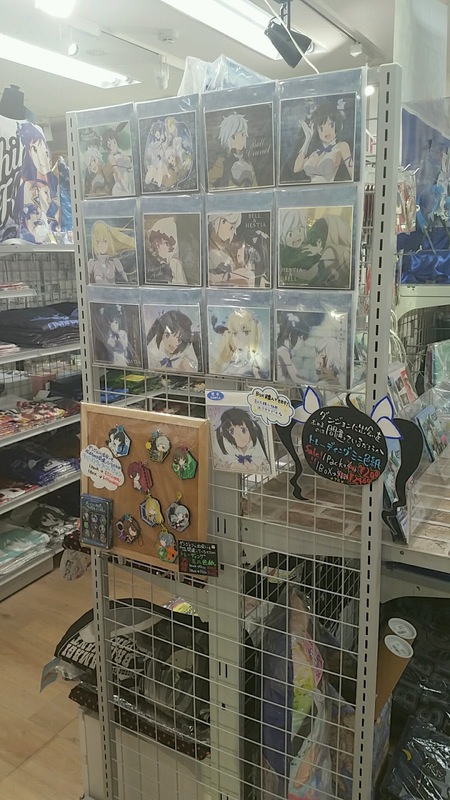 Some notable displays which they had were namely Sword Art Online, DanMachi, and Arpeggio of Blue Steel. 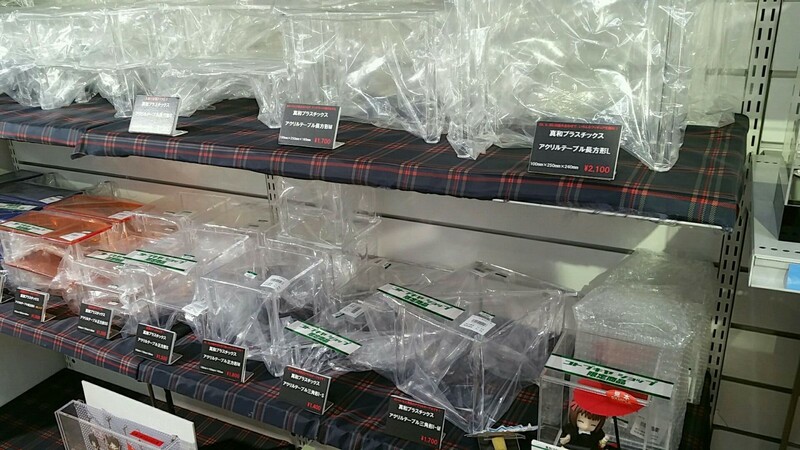 I should also mention that Kotobukiya sells cases as well, and some figures in cases are actually not for sale, but simply to illustrate which sizes of figures would fit best in the respective cases. The easy way to determine this would be the price tag. 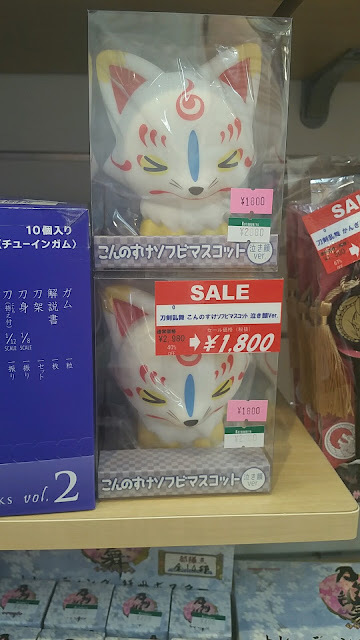 If a figure has a price tag for it, it's probably for sale. Below are some examples of the cases which are for sale. Sadly, they are a little too big and fragile to ship overseas, so they probably aren't a good choice unless you are living or planning to move to Japan in the near future! Kotobukiya also sells stands. They come in three different heights, and three different shapes as well. There are square, rectangular and triangular stands. 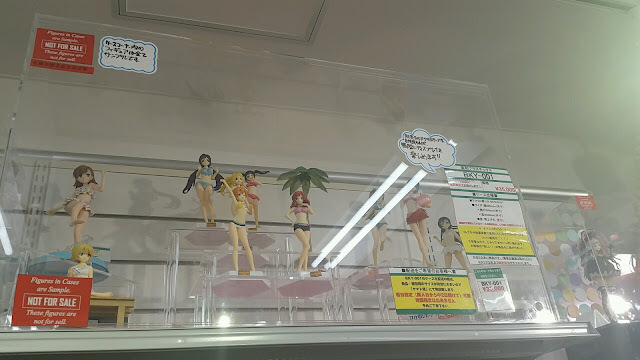 Whenever I come across triangular stands, I tend to think that they are specially made for Griffon Enterprises' figures. 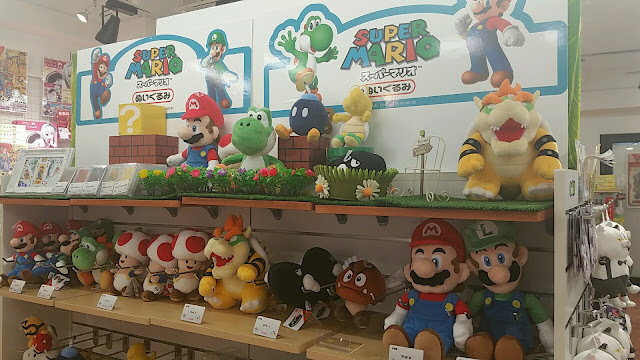 That aside, these stands come in various colors. 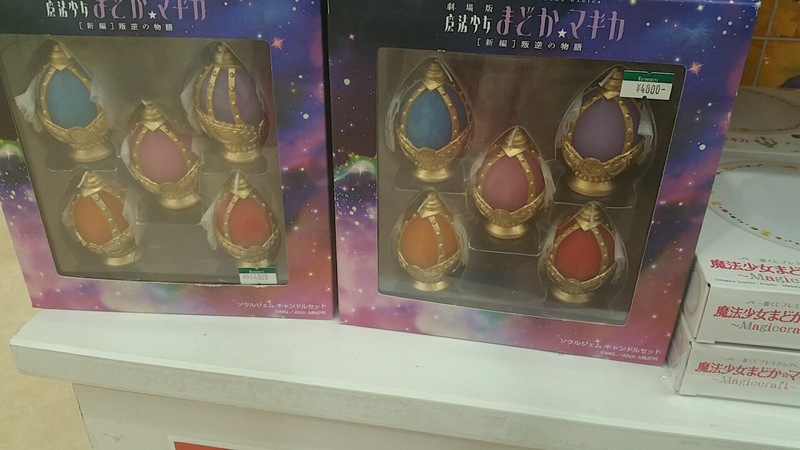 I remember seeing at least lime and pink colored stands in addition to the clear, blue and orange ones you can see in the image below. 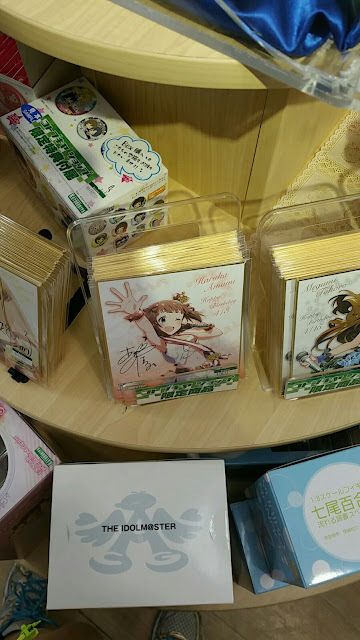 Kotobukiya has a point card system that has been in place for quite some time. 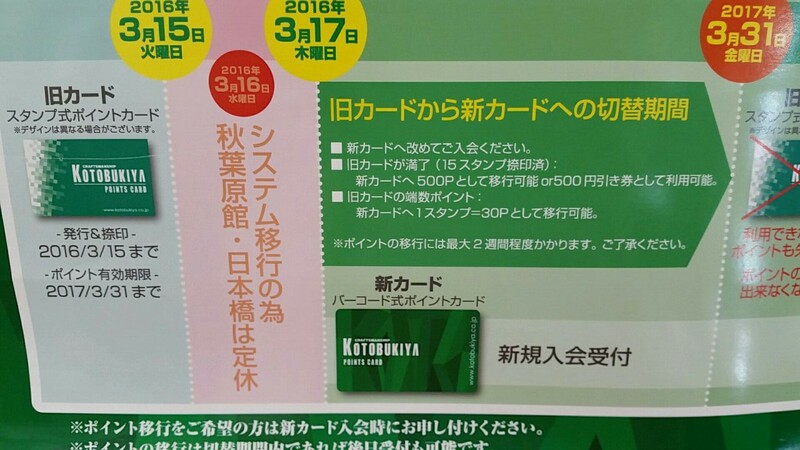 But it seems that they are now changing the point card system. 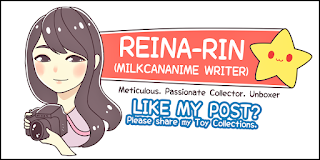 Unfortunately, I am not sure about the details of the new point card as I was unable to change it since my friend, who is the owner of the card wasn't present. 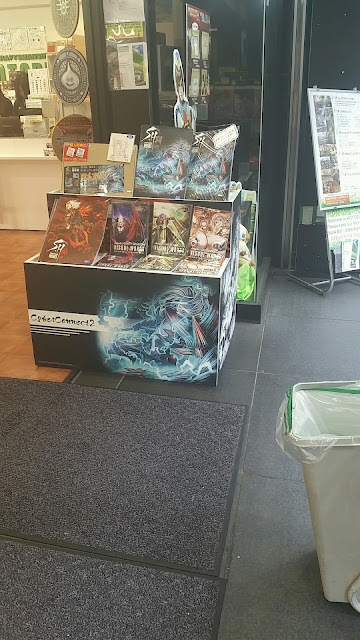 There are notices about it throughout the store and if you were to ask them about the new card, they would allow you to make one! No Comment to " Reina's Japan Trip, June 2016: Day 1 (Part I) [Akihabara, Tokyo] "